Sydney Clare is an artist photographer: shortlisted for Jerwood Visual Arts Artist’s Bursary 2017, she received an Honourable Mention; Abstract for ‘pike 3’ in the International Photography Awards. Fascinated by responses to her work as the viewer gets to grips with the idea of photography being truly abstract. The question of what the viewer is looking at remains a secret. The artist forces the viewer to work at interpreting what they are seeing. Sydney Clare’s work as an artist follows an initial career as mechanical engineer making diverse products such as aero engines for Rolls Royce and riding hats for Thomas Townend. She drew upon her business experience to set up in interior design and secondly a jewellery company, but has found her true passion in photography. She now draws upon all skills to maintain a professional and disciplined practice, whilst enjoying new freedom, creativity and artistic innovation. Hossein Farmini saw it as – ‘brilliant – very graphic and very pleasing’. What I photograph is secret. I explore views invisible to the naked eye. These tiny worlds have incredible beauty, resonate with the more visible world and yet are untouchable. The work is not what it seems, landscapes are not real, dusk is not dusk. Inspired by memories of my daughter’s absorption as a child examining objects in her hands for ages I took to looking closer and closer at objects close to hand when temporarily physically limited. Am delighted by my creation of mysterious, luminous images of the rejected, the damaged, the aged and overlooked. The objects photographed, although mundane, are mine and are kept safe from outside influence or damage. I am interested in the confusion created by the concept of turning things the size of a fingernail into the size of a window. All images are abstract: much pleasure is taken from interpretations of my work. Self taught, images taken in natural light at home with little manipulation apart from cropping. 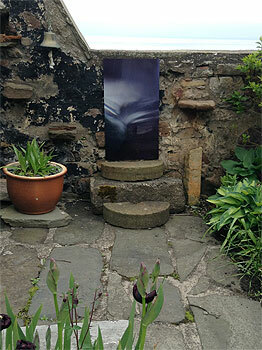 Printed onto aluminium using a dye sublimation process. Paul Klee said there’s a world between what we’re born to know and what we’re taught: children are born into this world, madmen get stuck and artists can travel through. He said when an artist wants to work in abstraction they have to know their craft so well they don’t think about the foundation – then they can go to the stars. I’m not there yet, I’m working on it. Images are printed on to aluminium or mirror using one of two printing processes: direct to media or a dye sublimation process. These give a smooth, stable and abrasion resistant image that is also weather resistant for up to 5 years. 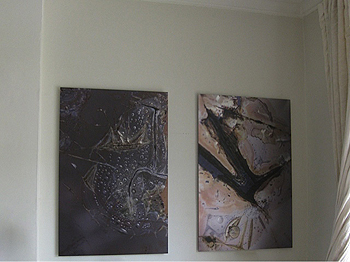 Images supplied with a frame and brackets for immediate hanging. 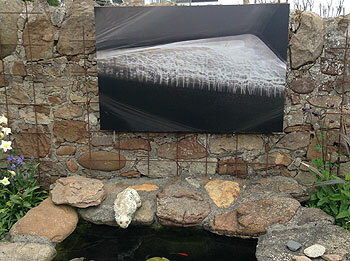 Images are mainly in editions of 5 or 7 and are approximately A2, A3, A1 (36”x24”) and A0 (48”x36”) or larger.